Abigel Arvina Gordon was born on Sept 16, 1998 in Orem, Utah and passed away December 28, 2018 in Sherman Oaks, California . Abigel is the second daughter born to Deanna Onika Dodge Gordon and Wesley Otto Gordon. She is survived by her 4 sisters and 5 brothers, Claudine Louis (Atlanta, GA), Madison Gordon (Scappoose, OR), Gracie Gordon (Ketchikan, AK), Rubi Gordon (Heber City, Utah), Jeremiah, Ezekiel, Elijah, Peter, & Ace Gordon (Heber City, Utah); grandparents Chris Dodge (Salem Utah), Jay & Peggy Gordon (Heber City, Utah); many cousins, aunts, uncles, relatives and dear friends. She is preceded in death by her grandfather Randy Dodge. Abigel's name means "A father's joy" and true to her name, she was always a daddy's little girl. When she was 3 months old, doctors discovered a congenital heart defect and immediately scheduled open heart surgery. After 31 days in Primary Children's Hospital, Abi was discharged with a feeding tube and round the clock medications. The twinkle in her eye never waivered. Abigel lived in Homer, Alaska as a young child and enjoyed adventures such as exploring tide pools, hiking, and playing hockey where she was able to exert her aggressive competitive nature on the ice. The family moved to Missouri in 2006 where Abigel made some lifelong friends who attended Abi on her many wild pursuits. She was an absolute daredevil. She relished making everyone laugh and was never afraid of an audience. In 2012, Abigel started school at Wasatch High and continued to gather her collection of friends. Abigel started dating Christian Salamanca in Heber CIty and the two of them enjoyed mischief and fun for 2 1/2 years. 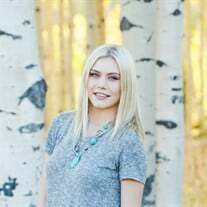 Abigel started working at various jobs in Park City and Heber, and every where she went she was praised for her work ethic and her focus on doing a great job with her assigned tasks. She was never accused of being lazy. Recently, Abi moved to California with her closest friend Michaela Crockett and was living and working there. Abi was a tough tomboy to the core until she became a teenager, when our gruff voiced Abi turned into a dancing diva. She was famous for her comical nature. She and her sisters spent many hours laughing together, with Abi's funny faces and silliness as the entertainment. Abi had a deep love for people and every person she met could recognize her vitality and zest for living. She had a true talent for making and keeping friends, endearing her to those around her, that will ensure that her light will live on in many hearts. Friends near and far are welcome to gather for her services.